Pedaling into the office for a day of work takes commitment on its own, but there's a second commitment you need to make when you get there: keeping your steed secure. 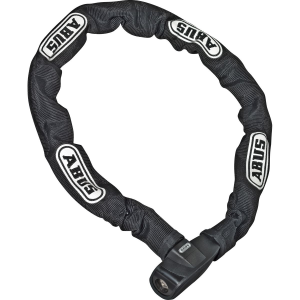 The Abus Catena 685 Key Chain Lock makes for a solid option to give you peace of mind while you work away, thanks to its 110cm length of temper hardened steel chain links wrapping around your ride. The chain is wrapped up in a burly nylon sleeve, keeping your bike protected from scratches, and the chain its self protected from the elements outside, should the weatherman call for a drizzle. The lock is lighter than many U-locks, making it easier to carry when wrapped around your seatpost, but admittedly not quite as strong, so if your office is in an urban metropolis you might want to consider something a little burlier. It has a lock head that is pick-resistant, and comes along with two keys, so you can keep a backup in your desk at work in case you forgot your keys on top of the dresser at home.